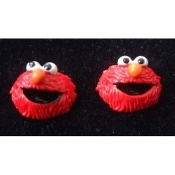 Mini Funky ELMO EARRINGS - Sesame Street 3-D TV RED MONSTER BUTTON Jewelry - Resin Dimensional Stud Charms, each approx. 5/8-inch diameter. Surgical stainless steel Posts with comfort disc backs. These are sooooo cute!